Home Products Mellerware Induction Cooker LED Display Crystal Black Variable Heat Settings 2000W "Capri"
Mellerware Induction Cooker LED Display Crystal Black Variable Heat Settings 2000W "Capri"
The future is here with the Mellerware Capri Induction Set. 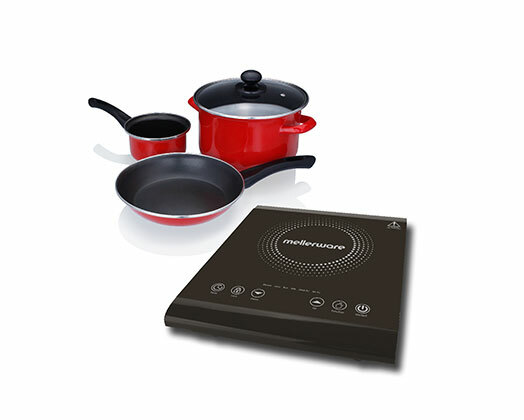 The induction cooker has a black crystal plate and inductive electromagnet that heats your cookware directly. The induction cooker has various cooking modes for you to choose from. Included in the set is a 24cm non-stick casserole pot with tempered glass lid, a 24cm non-stick pan and a 14cm non-stick sauce pot, all with cool touch handles and knob.